Barron Hilton, son of Conrad Hilton, founded Conrad Hotels, taking the name from that of his father. Hilton Hotels was, at the time, a separate company from Hilton International, and could not operate hotels outside the United States under the Hilton name. The newly named chain solved that problem. Hilton International had already started their own chain of Vista Hotels within the United States, as they faced the same prohibition on operating there under the Hilton name. The first Conrad hotel, the Conrad Jupiters Gold Coast in Australia, opened its doors in 1985. When the two Hilton chains were rejoined in 2005, the need for the Vista and Conrad names vanished. Vista was phased out, while the Conrad brand was retained as a luxury wing of Hilton. Numerous hotels have since been opened under that name in the United States. ^ "Upcoming Openings". Conrad Hotels & Resorts. Retrieved 15 October 2013. 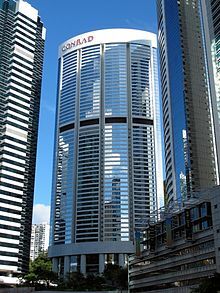 Wikimedia Commons has media related to Conrad Hotels. This page was last edited on 19 April 2019, at 03:44 (UTC).